Remove gunk and buildup on the inside of washing machine. 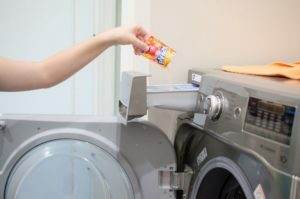 Use lemon or orange Kool-Aid to break up the buildup in your washing machine. It's the citric acid that does it. Put 1/4 cup Kool-Aid in a regular wash cycle- without any clothes and do this as needed. Removing rust and stains from your concrete. Make a paste with a few drops of water with a packet of lemon flavored Kool-Aid. Use a brush to scrub off the stains. The paste with the citric acid does wonders for your driveway or patio. 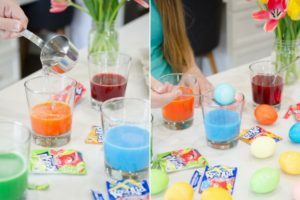 Easter is almost here instead of buying the dyes just use one packet of each Kool-Aid color and 2/3 cup water into separate glasses stir to dissolve. Use a spoon to place the hard-boiled egg into each cup. 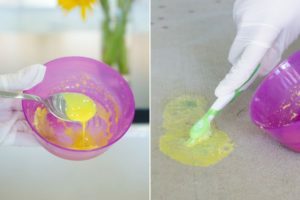 Leave the egg in the Kool-Aid until the desired color is reached. Checking your toilet tank for leaks. Take off the lid and pour in a dark-colored Kool-Aid packet. 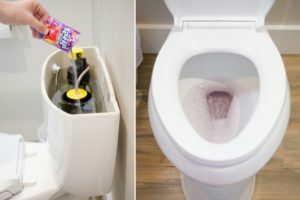 Wait 3o minutes without flushing the toilet. If any of the colored water appears in the toilet bowl, there is a leak. You might have to replace the flapper, or you may have to investigate further. 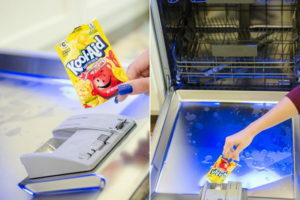 Take a Kool-Aid packet and put it in your detergent compartment in your dishwasher. Be sure it is empty no dishes needed to this. Run a normal cycle. The citric acid will help remove buildup. I found these tips on Pinterest.